Heat up 1 tsp of oil in a pan. Apply little turmeric powder on boiled eggs and roast till they starts to get slight brown color. Once they cool down make vertical slits and keep them aside. Heat up 3 tsp of oil in pan. Add mustard seeds, cumin seeds, bay leaves and let them crackle. Add chopped onion and saute till onion becomes translucent. Add pinch of asafoetida, turmeric powder, ginger garlic paste and saute for few seconds. Add hot water to it and mix well. Add tamarind paste concentrate and let curry boil on medium heat. Once curry comes to boil, add boiled eggs. Add dry fenugreek leaves and chopped cilantro. let curry simmer on low heat for about 5-6 minutes. Serve hot with roti or rice. Take wheat flour in a mixing bowl. Add cumin powder, carom seeds and salt to taste. Add 1/2 tsp oil and mix well. Remove all lumps. Add yogurt and start kneading the dough by adding little water. Consistency of a dough should be soft like regular chapati dough. Cover the dough and let it rest for about 30-40 minutes. Make the equal medium sized balls. Take one ball, dip into flour and roll like a big sized thin chapati. Spread some oil on it and sprinkle little flour on it. Now pleat the chapati onto one side. 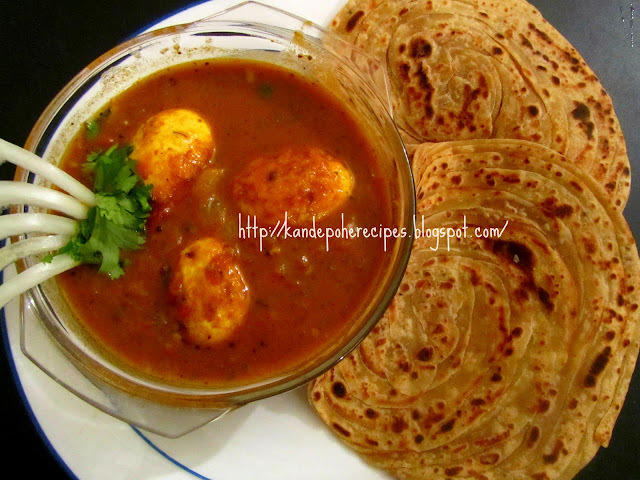 Coil the pleated chapati to make round ball. Sprinkle some flour on it and roll gently. Thickness of paratha should be medium. Roast paratha from both the sides using ghee or oil. Serve with any kind of Indian curry.